It is safe to say that disasters can happen when we least expect them to. So what is the use of having all the cool survival gadgets, if you only use them on the camping excursions? Experts say you will not have an adequate understanding of how to use your gear, and could get hurt in the process if you do not regularly use your survival gear. That being said, there are certain survival essentials, suggested by the Boy Scouts that I have on me at all times. Having these items on hand, brings peace of mind and assists me in every day functions. 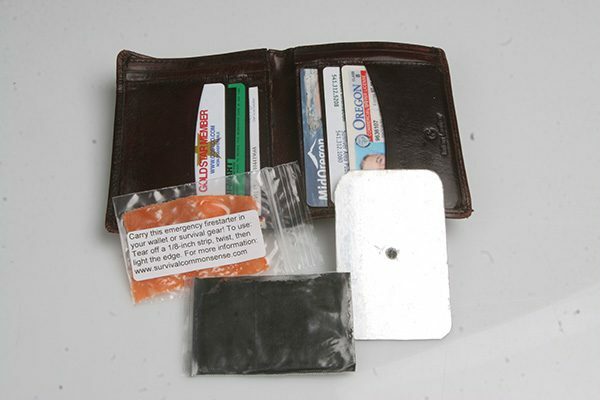 Carrying a mini-survival kit can be achieved without weighing a person down. In fact, in my case, it lightened up some of the load that I regularly carried around. As I type this, I have a butane lighter in my pocket, a whistle, knife, fingernail clippers, LED flashlight, small knife and magnesium stick on my belt clip, and a Swiss Army knife in my belt pouch. My wallet hasfire starter, char cloth and a signal mirror in it. This gear goes with me everywhere it’s legal…If I have to sprint for the door and can’t grab anything else, I have the minimum tools on me to make a fire and stay warm and signal for help…If I can grab my jacket on the way out the door, there is an Altoids tin mini-survival kit in the pocket. And if I can get to my car there is a full component of survival gear in there, including food, water, a sleeping bag, and several tarps. I won’t waste any time looking for equipment, when the walls may literally be falling down around me. Find the right pack that will fit the gear you need. Since I have a larger family, I have to tote around more gear. I have finally come to the conclusion not to sacrifice functionality for fashion. If a person decides to carry a “carry all,” pack, Altoids tin or a purse, you must not look at fashion as being an important aspect of your decision making prodess. Just like with any pack, the weight is so important. If you are lugging around a heavy purse or heavy pack, in the long run, it’s going to be exhausting. That is what I hated about my previous purses, they were so incredibly heavy. Additionally, your pack should be durable and reliable through all seasons. My day pack is 13 ounces and can hold 800 cubic inches of survival gear. It has hidden compartments, and essential pockets to help me organize my supplies. Keep basic tools with you at all times. 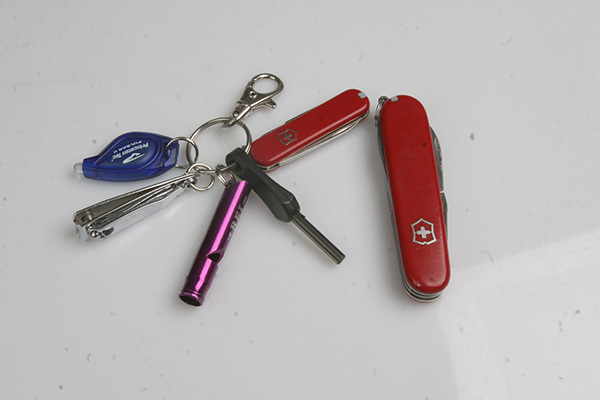 On the keyring: LED flashlight, fingernail clippers, whistle, Boy Scout Hot Spark and Classic Swiss Army knife. The other knife rides in a pouch on my belt. Carry survival gear in your wallet. I always have (from left) firestarter, charcloth and a signal mirror with me. These essential items, I have placed in my daypack which goes everywhere I go. Additionally, we have more gear in our BOV (Bug Out Vehicle) in case we are stranded. It is always a good rule of thumb to be overly prepared rather than under prepared for a situation. Now that I am carrying my gear around, I am using it more often and feel more capable of getting to safety just by having it on me.